Whiteoak High School’s Caleb West is pictured with Andrea West, RN, corporate director of marketing, CareCore Health. 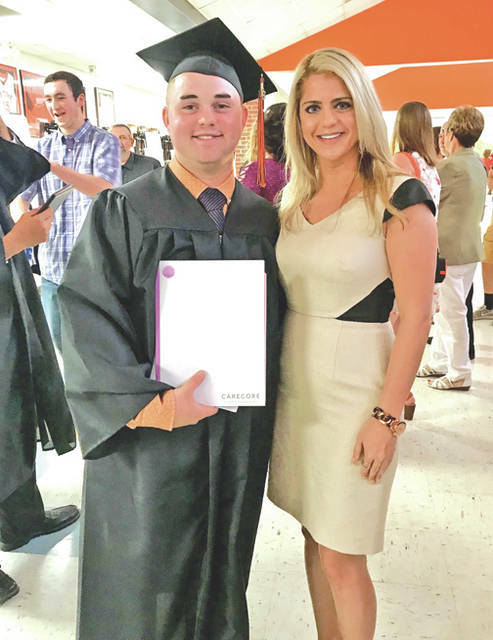 Whiteoak High School graduate Caleb West has been selected as a recipient by CareCore Health of a scholarship to further his education. The award was given to West as someone who exemplified outstanding community values. The CareCore Health scholarship fund was established to recognize outstanding full-time students from local communities, who are continuing their education at the collegiate level and who have achieved positive academic records. CareCore Health owns and operate three facilities in Ohio. Each is special in its own way – CareCore at Lakeridge has a 50-bed secured unit, CareCore at Montgomery has a dedicated short-term unit and specializes in top-level clinical care and service, and CareCore at Westmoreland, located in Chillicothe, has 60 beds that are utilized for its dementia program. West is a 2018 Whiteoak graduate. He was a member of the Wildcat baseball team that was undefeated in the Southern Hills Athletic Conference. West was named to the All-SHAC, 1st team all-district, 1st team all-state, and All-district Academic Team. He was selected as the MVP in the district all-star game and was named to the All-Ohio Mizuno team. Along with athletic recognition, West earned his associate’s degree from Southern State Community College by participating in Post-Secondary Option while in high school. He was on the dean’s list and maintained a 3.7 GPA. West plans to further his education this fall and will be majoring in engineering. Submitted by Montgomery Care Center. https://www.timesgazette.com/wp-content/uploads/sites/33/2018/07/web1_West-pic.jpgWhiteoak High School’s Caleb West is pictured with Andrea West, RN, corporate director of marketing, CareCore Health.